The federal government's dietary guidelines have a stilted history. When I was growing up, the U.S. Department of Agriculture (USDA) promoted the Basic Four Food Groups as the construct of the ideal diet, with meat and dairy constituting half of the food groups and fruits and vegetables bunched into a single slot (and grains into the other). That dietary framework was driven not by health considerations, but by the influence of the meat and dairy lobbies. It was a marketing initiative that helped convince American consumers to eat more animal products than any other people in the world. As with the federal government paying for research and development for factory farms through the U.S. Meat Animal Research Center, created in 1964, the former dietary guidelines reflected the worst elements of crony capitalism – with special interests influencing government to favor industrial agriculture at the expense of consumers, family farmers, and the public health. It's been some time since the Basic Four Food Groups, and the USDA's subsequent dietary guidelines have been more balanced and more science-based. The latest iteration is most certainly a big step forward. Last week, the Dietary Guidelines Advisory Committee (DGAC) consisting of 14 health experts charged with advising the USDA and the Department of Health and Human Services (HHS), recommended that Americans should eat a diet that includes more plant-based foods and fewer animal-based foods. 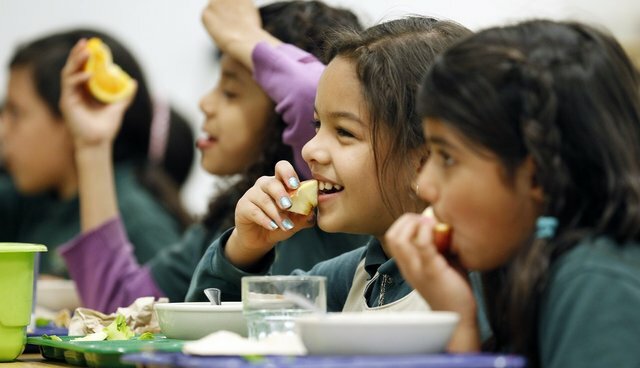 The largest U.S. institutions, including the $16 billion national school lunch program, shape their food policies in accordance with these guidelines. Predictably, lobbyists from the meat and dairy industries are already hectoring government decision makers to disregard the report's recommendations. Last year, these groups launched a campaign pressuring lawmakers to include language in a spending bill directing the Dietary Guidelines Advisory Committee to forgo sustainability considerations when drafting their report. The committee included sustainability in their report anyway, and advised a decrease in our animal-based food consumption. We urge the USDA and the HHS to follow the expert recommendations in the report and put our health and that of the planet above the profits of factory farming interests. Our military bases, hospitals, and universities need sound advice to make healthy, humane, and sustainable choices for the people they serve. Our school lunch programs need backing to create healthier menus that, in turn, will create healthier children. In our work with schools, we've found an incredible amount of support from administrators, nutritionists, and parents for healthy and balanced meals, including more easy and delicious plant-based foods. Our staff has worked with hundreds of school districts that are now participating in Meatless Monday programs. These include some of the largest school districts in the country, like the Los Angeles Unified School District, Detroit Public Schools (which now has two meatless days a week), Houston Independent School District, and Philadelphia Public Schools. Meat will continue to be a major part of the American diet, and we hope that as consumers eat less meat, they place greater value on the animal products they do buy – choosing meat from farmers who raise the animals in extensive systems and don't lace their feed with antibiotics, hormones, and dangerous growth-promoting drugs like ractopamine. As for incorporating more plant-based foods into our diets, superabundant data show that diets richer in fruits, vegetables, and grains produce less heart disease, cancer, obesity, and diabetes. The HSUS has been providing comment to the agencies all along, and we'll be submitting comments in support of the report's recommendations. You too can demand that your government protect your health over the financial health of large industries by leaving your comments here.